1) Singapore, Belawan (Deli), Penang. 2) Singapore, Hong Kong, Swatow, Amoy. Nieuw Zeeland Singapore, Batavia, Semarang, Sourabaya, Brisbane, Sydney, Melbourne, Adelaide. 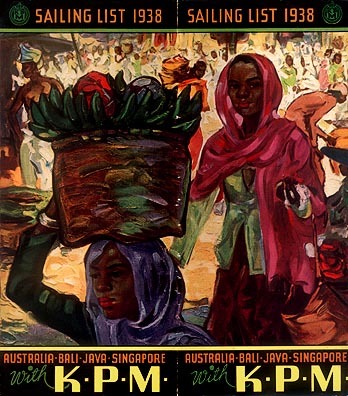 Return voyages: Adelaide, Melbourne, Sydney, Brisbane, Makassar, Sourabaya, Semarang, Batavia, Singapore. Swartenhondt 1) Shanghai, Manila, Saigon, Koh Si Chang (Bangkok), Singapore, Batavia, Mauritius, Lourenço Marques, Durban, East London, Port Elizabeth, Mossel Bay, Cape Town, Durban, Tamatave, Réunion, Mauritius, Rodriguez, Batavia, Singapore, Saigon, Hong Kong. Called at Cebu, Ilo Ilo and other Philippine ports "if sufficient inducement offered", also other Madagascar ports on homeward voyages. 2) Hong Kong, Koh Si Chang (Bangkok), Singapore, Batavia, Rodriguez, Mauritius, Réunion, Tamatave, Durban, Lourenço Marques, Beira, Zanzibar, Mombasa, Mahé, Sabang, Singapore, Hong Kong, Shanghai. Called at Moçambique, Dar-es-Salaam and Tanga "if sufficient inducement offered". 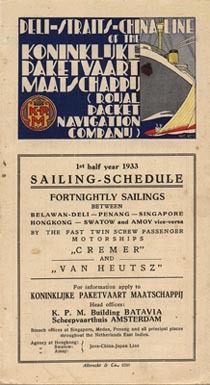 Hong Kong, Manila, Saigon, Bangkok, Singapore, Batavia, Rodriguez, Mauritius, Réunion, Tamatave, Lourenço Marques, Durban, East London, Port Elizabeth, Mossel Bay, Cape Town. 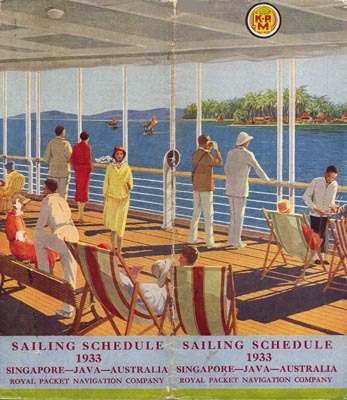 Also Zanzibar, Mombasa, Mahé, Belawan Deli and Shanghai on homeward voyages. Tegelberg Hong Kong, Manila, Saigon, Bangkok, Singapore, Batavia, Rodriguez, Mauritius, Reunion, Tamatave, Lourenço Marques, Durban, Cape Town. Return: Cape Town, Mossel Bay, Port Elizabeth, East London, Durban, Mauritius, Reunion, Tamatave, Zanzibar, Mombasa, Mahé, Belawan, Singapore, Hong Kong, Shanghai. Maetsuycker Saigon, Singapore, Batavia, Semarang, Sourabaya, Port Moresby, Samarai, Salamaua, Rabaul, Auckland, Wellington, Sydney. Return: Sydney, Port Moresby, Sourabaya, Semarang, Batavia, Singapore, Saigon. Tasman Saigon, Singapore, Batavia, Semarang, Sourabaya, Port Moresby, Port Vila, Noumea, Auckland, Wellington, Sydney. Nieuw Zeeland Singapore, Batavia, Semarang, Sourabaya, Bali, Brisbane, Sydney, Melbourne, Adelaide. 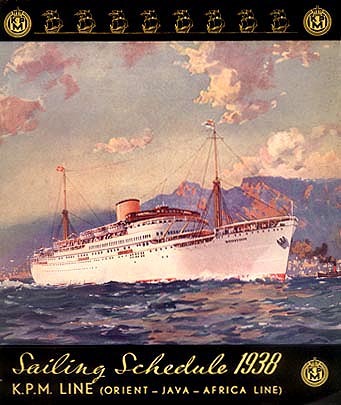 Called also at Macassar between Brisbane and Bali on return voyages. Tjinegara Shanghai, Amoy, Hong Kong, Manila, Cebu, Menado, Macassar, Bali, Sourabaya. Return: Sourabaya, Macassar, Balikpapan, Manila, Hong Kong, Amoy, Shanghai. 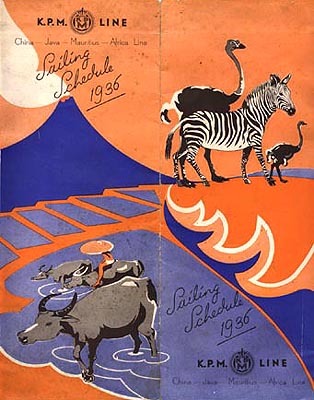 See the archives section for more brochures of KPM Line.